Season two of Westworld is in the books. It was a bit of a rough, uneven experience for us, and we suspect from the vast amount of feedback we got this past week, a lot of you as well. But, the bones of Westworld are still sound, and the table is set for season three to be more expansive and interesting than the at time claustrophobic and confusing season two. We discuss our hopes and fears for next season, discuss some leading though on simulations, brain scans, and AI before considering lingering thoughts and questions from our fellow fans. By all accounts it's going to be a long wait for next season, but we hope to see you back then! Reasonable people may disagree, but for Jim and I, the finale of HBO's Westworld season two, "The Passenger" failed to justify an ultimately flawed and uneven 10.5 hours of television. We're not ready to write the show off by any means, it's too well constructed with too much talent for that. But we can't help but think of it as a misstep that is going to justify a lot of fans decisions to give up on the show. Next week, we'll be back to discuss our overall thoughts on the season, and what we hope for and expect coming into season three. Please send us feedback if you want to join in on that discussion! This week's episode of HBO's Westworld, "Vanishing Point" does a excellent job of setting up next week's finale. That finale has a lot riding on it, with seemingly endless permutations of possibilities of who's a host, who's a human, what's real and what's simulated that have to be coalesced down to a single possiblity. But we're getting ahead of ourselves, because if you watched this episode purely for it's plot mechanics you missed out on a lot of wonderful writing and acting that lead to some amazing character development for most of the main cast, revealing brand new relationships we didn't even know were there, giving more depth to the ones we had, and utterly shattering a few more. And yeah, there are just a ton of theories involving who is a host and what will happen in the Valley Beyond next episode! Can't wait to discuss it all with you then! This week's episode of HBO's Westworld was truly a thing of beauty. Learning about the long and winding journey of Akecheta, exquisitely played by Zahn McClarnon, in his search for truth, meaning, and his long lost love, was as profound a watching experience as I've had these past few years. Along the way he unlocks his own consciousness, meets god and the devil, and learns about a path his people may take to be free forever. Will he reach The Door? What, and who, will he find there? And will Maeve make it to be reunited with her daughter currently under Akecheta's protection? We discuss this, you feedback, and the theories and speculation everyone's buzzing about on this week's pod! In this week's episode of HBO's Westworld, "Les Ecorches", Bernard and Ford have a heart to heart, Dolores flips her daddy's wig, William is betrayed by his old buddy Lawrence, Maeve makes a promise that she might not be able to keep, and the end game involving the Valley Beyond starts to come into focus. 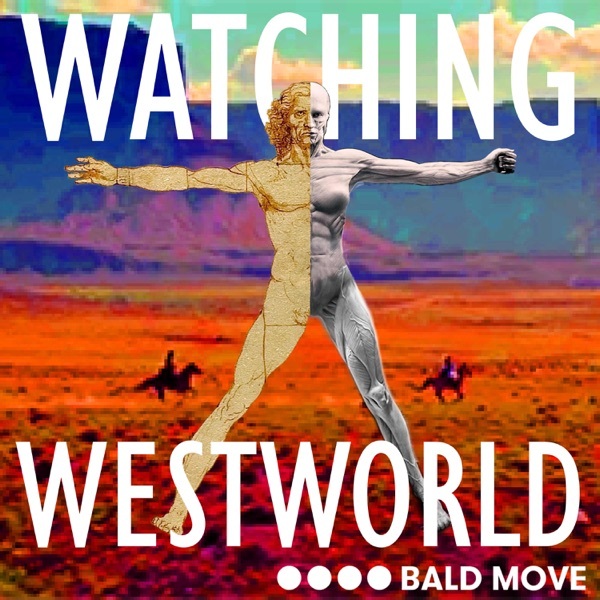 We also discuss our feelings about the way action is being handled on the show, debate whether the structure of Westworld itself is necessary, and consider a ton of feedback, theories, and speculation for what's to come! In this week's episode of HBO's Westworld, "Phase Space", Maeve learns the soft limits of her power, the Man in Black has a heartfelt conversation with his daughter, Teddy gets "fixed", Bernard introduces us to the CR8-DL, and a fresh crop of a-holes from Delos Corporate literally parachute onto the Mesa, leaving us unimpressed. We also discuss a boat load of email, speculation and theories at the end of the podcast! Welcome to Shogun World! HBO's Westworld expands its horizons in the latest episode, "Akane No Mai", as we get to meet a cast of entirely new but strangely familiar characters in a deadly new location. We also get to find out some more info about the role of the mysterious Cradle, watch Maeve as she discovers a new "superpower", and Teddy and Dolores have a falling out over there very different approaches to veterinary medicine. We discuss this as well as your feedback and popular theories and speculation. In Westworld episode 204, "Riddle of the Sphinx", we're asked to consider if mortality is a core feature of humanity, or is it merely a bug to be fixed later in code? What is "good enough" when it comes to consciousness transfer? If you can be copied and therefore replaced, does that mean you are no longer real, as Arnold stated at the outset of the season? Aside from these heady topics, we discuss Bernard becoming lost in his reveries, the triumphant return of one of our favorite techs, and if William is in for something of a redemptive arc, or is he, as he himself maintains, just playing Ford's game "to the bone"? All this, tons of feedback, and a bit of speculation and crazy theories at the end! In this week's episode of HBO's Westworld, "Reunion", they add three or four timelines to play with. No big deal. We find out more about this "Valley Beyond" or "Place of Judgment" that William and Dolores seem to be racing towards to see who can get there first. William wants to burn the place to the ground, Dolores hopes to find a powerful weapon to use against her human oppressors. Maeve is caught in between, just a woman trying to find her daughter in this crazy 'World. Lots of analysis, and a healthy speculation section at the end for those of you who want to out think show runners Nolan and Joy! The opening salvo fired in HBO's Westworld season two premiere wasn't what we were expecting. We were expecting literal salvos fired by lots of angry hosts into lots of frightened guests, which, you know, that's certainly there. But there is so much more. What to make of Bernard's time bending descent into near death madness, Dolores oddly performative attempted takeover of the park, Maeve's increasing attachment to various fellow hosts, to say nothing of what Delos is up to trafficking in the rich and famous DNA and memory trade. What are creators Nolan and Joy up to? If it's anything like last season, it will take until the finale to tease all the secrets of Westworld out! The long awaited sophomore season of HBO's Westworld returns this weekend, and we've been champing at the bit. We discuss the open questions from last season, the tantalizing glimpses of the future we've seen from the trailers so far, and discuss upcoming format changes and our policy on spoilers and speculation. Why is William's past still relevant to the story? What is the door, and how are we supposed to find it? Are Dolores and Maeve running diametrically opposed armies? What is Delos up to with their secret project? Is a robot searching for it's artificial daughter any more sad and pointless than anything we do in our day to day lives? Why or why not? These and many more questions are entertained as we await answers! Jim and A.Ron put season one of HBO's Westworld in cold storage by talking about our overall thoughts, opinions, and hopes for next season. Then we consider a giant sized mailbag where we discuss scalp maps, the nature of consciousness and free will, the impact of self aware robotic hosts on fast food chains, and much more. We'll be back whenever Westworld returns, but we never really go away. In 2017 we have an early line up including The Leftovers, Better Call Saul, Game of Thrones, among others. Hope we see you around! A.Ron and Jim are very pleased with how the violent delights over season one would up having violent ends in the finale episode for Westworld, "The Bicameral Mind". Sure, maybe the first third of the episode was merely review for a class that has studied their podcasts and their reddit. But once Hector and Armistice got their hands on the P90s, it was pedal to the metal until the conclusion that we found extremely satisfying. Not only that, it setup season two so well that it's almost criminal that we'll have to wait until 2018 to find out more. But you won't have to wait that long for Watching Westworld, we'll be back next week for a wrap up podcast where we'll consider your ideas for next season, including theories, thoughts on consciousness and sentience, casting suggestions, and who knows what else. See you then! Many more puzzle pieces fell into place over the weekend as HBO's Westworld deployed episode 109, "The Well-Tempered Clavier". But there is still a lot left to uncover. Why did Dr. Ford deploy the reverie code? What is his ultimate intentions for his new narrative and indeed future of the park? What are those sentient robots doing hiding up in the hills of Westworld? And what does the Man in Black intend to do with Delores once he finds her? We're excited to see how things wrap up next week, as we're hoping to get a glimpse of how Nolan and Joy intend to expand this series going forward. See you then! Jim and A.Ron take in the latest episode of HBO's Westworld, "Trace Decay". Timelines are continuing to proliferate (we're up to four now, in case you're keeping score at home), everybody is still potentially a host, and William is probably the MiB after all. But there's a lot of nice stuff here, from the increasingly evident narcisism and nihilism of Dr. Ford to Bernard struggling to cope with his new station in life. And hooboy, is this "upload 35 years worth of Westworld madness into this Abernathy guy's head" plan of Hale's going to be a glorious trainwreck or what? Lots of stuff to look forward to, and keep in mind we've got just two short weeks before god knows how long of a hiatus. So savor all the timelines, hosts, and idiot techs while you can. The floodgates have opened after the release of the newest episode of HBO's Westworld, "Trompe L'Oeil". Everyone is a host, unless you think they're a host, then they're a double secret human. There are at least five timelines, six of which take place on Mars. The robots can kill, unless they're Clementine, but then again she's an expert at faking it. If you've experienced trauma from watching this episode, never fear. Buffalo are standing by to provide medical care and O negative blood and will be there to assist soon. Seems like whether you loved the latest episode of HBO's Westworld, "The Adversary" depends on how much you bought into Maeve running roughshod over two bumbling technicians toiling in the bowls of Westworld's meat department. Jim's struggling with this. Meanwhile A.Ron might very well be teetering too close to the crazy town of Tinfoil. We record, you decide! Looks like multiple timelines is back on the menu! Just when we had completely written of the various timeline theories, they come roaring back in episode 105, "Contrapasso". Not saying that any theory at this point is on entirely solid ground, but let's just say we've got our laser-based satellite receivers aimed squarely at Orion's belt. The point is a lot went down this episode. El Lazo turns out to be Lawerence, Dolores comes out slingin', Elsie's pounding Bernard's desk with bloody robot parts, and Dr. Ford has a personal showdown with the mysterious Man in Black. Lots of stuff to be read into this week, and we spend a good amount of time doing just that. Plus, tons of feedback on evolution, ethics, and genitalia! Another intriguing and informative episode of HBO's Westworld is in the books, and we continue to have a lot to discuss. In "Dissonance Theory", we learn that Ford has god-like control of the park, that the robots are largely made of "meat", that Maeve is coming dangerously close to unraveling the illusion of her life, and that Bernard is intentionally steering Dolores towards the mysterious end-game of Westworld, the maze. Jim and A.Ron try to round up Westworld's latest episode, "The Stray", but corralling the big ideas this show brings to the table is proving to be quite a challenge. We appreciate the focus on the "human" element of Westworld, getting much more backstory for Bernard and Dr. Ford. But how straight a shooter is Dr. Ford? How much of his tale is fact, and how much of it carefully curated legend, intended to deceive both Bernard and the audience? Wheels within wheels! Jim and A.Ron have a lot to say about the second episode of HBO's new hit series, Westworld, entitled "Chestnut". We talk a lot about the developing characters and mysteries of the show, trying to figure out what Bernard and Dr. Ford are up to, while trying to understand the motives and mind of Dolores. Along the way, we find out surprising things about each other, like our true feelings about dusty old prospectors found lying in the street. It's quiet beautiful, really. And hey, we got lots of feedback, theories, and analysis by our dashing and witty listeners! Jim and A.Ron spend a bit of time talking about the upcoming season of HBO's new sci-fi/western, Westworld. We discuss the multiple reasons to be excited, from the creative and talent pedigree of the project, to the stellar advance reviews the series has enjoyed. Can the series live up to it's promise, and hype, to become HBO's next Game of Thrones sized megahit? Will the concept be able to sustain more than just one or two seasons? What does Westworld look like in four seasons? We'll find out together, but in the meantime, please send us any feedback or thoughts you have!